The Urinals of "Irish Pub"
"Irish Pub" is an irish pub located in Chiang Mai, Thailand. This picture was submitted by lynn g. She writes: "They had delicious breads and eggs & bacon for breakfast, a rare find in thailand. 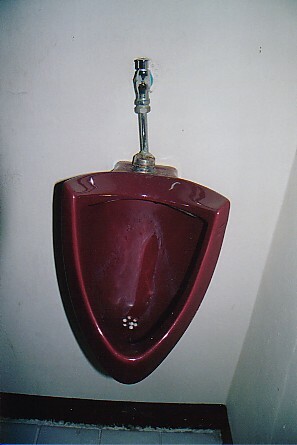 For a reason I don't know, many of the toilets and urinals throughout thailand were burgundy like this one."